Well, well well it seems that the DWP aren’t giving up as Teresa May suggested. My instincts were right in thinking that they would continue the planned roll out, after all they had just employed new staff especially for this purpose at a Jobcentre in a nearby town. Today I received a rather interesting email. It was from an organisation called Poverty Agenda Group Oldham And Tameside They work closely alongside several networks and organisations to provide resources and help to raise awareness, and to also provide practical help to those living in poverty across the Greater Manchester area. 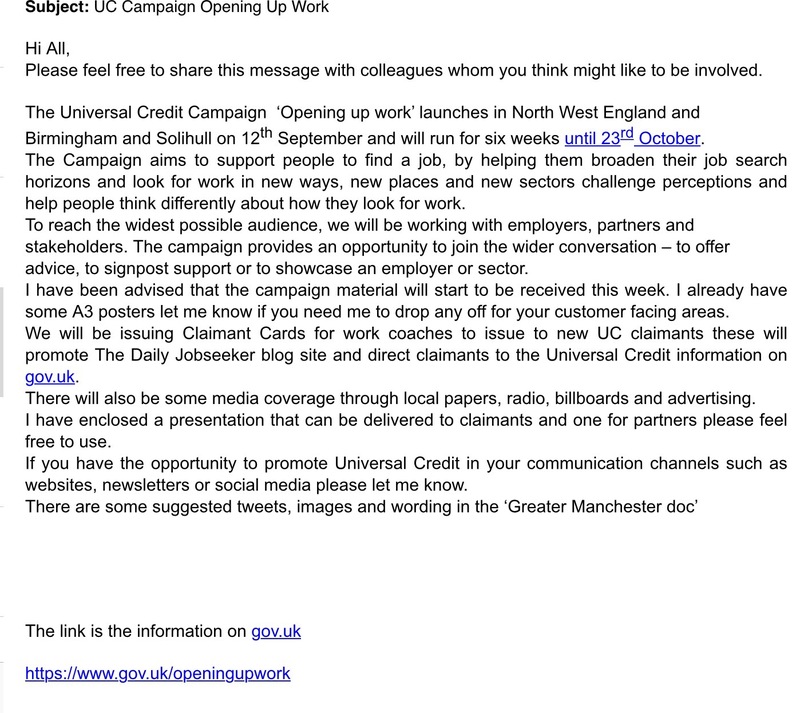 In this email that was sent out, it included a selection of roll out tools for the promotion of Universal credit. Now I found this extremely interesting as Universal credit has been proven to not make work pay. The waiting time for a Universal Credit claim to be processed at its quickest is six weeks, the longest period of time that I have heard of is three months. So why are The Poverty Agenda Group Oldham And Tameside Group communicating with the DWP? Now included in this email is a complete tool kit which will give organisations everything that they would need to promote Universal Credit. So I have had a good look, and have picked some of the misleading information out to highlight to the readers of my blog. I do know that what I am about to show you is nothing new, but it does no harm indeed to show you again. People forget quickly. Now take note. This is the propaganda. Below is an image of the reality. You are not better off in work whilst on Universal Credit, you are actually worse off. As from April 2016 the back to work bonus was taken away, leaving claimants with no benefit at all. Quite simply you end up worse off. 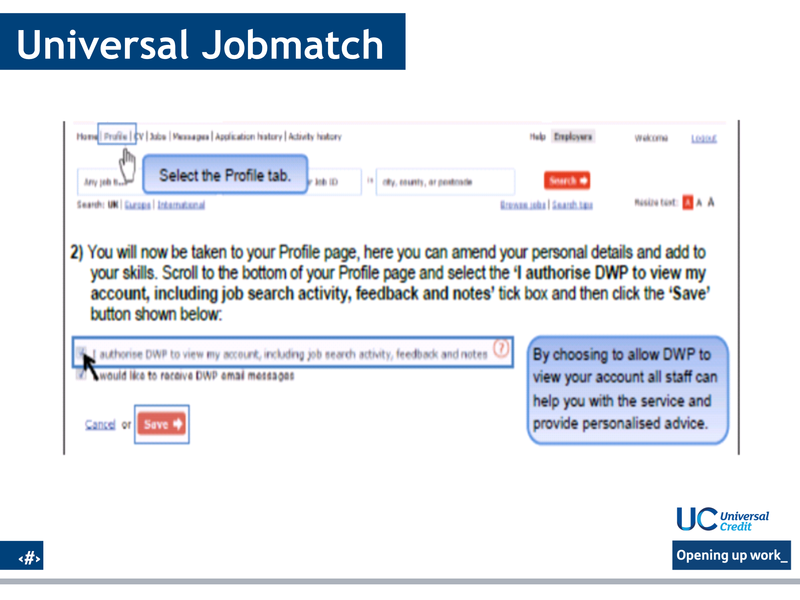 It seems that the DWP has failed to correct their promotional material. 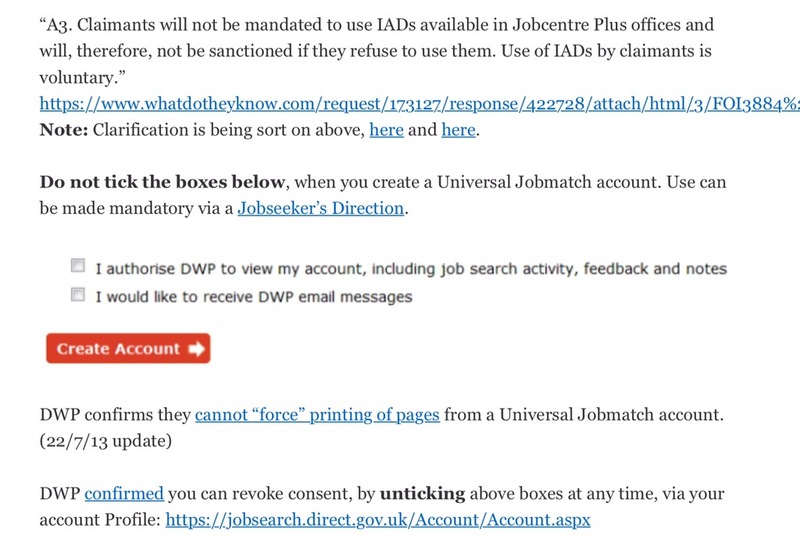 Also in the material given, the DWP tries to pursuade organisations to ensure that claimants tick the boxes on the Universal Jobmatch job search account that claimants are forced to sign up to. Now if a claimant does this, they loose all privacy and their unreasonable job searches will be monitored at all times. I’ve seen cases of when a claimant was ten minutes short on their job search and they had their Universal Credit payments sanctioned. The amount of time that claimants have to search for jobs is entirely individual, for some claimants they have to job search for 35 hours a week. However in a recent freedom of information request it shows that legally you have no obligation to tick that box at all, and indeed the accompanying box next to it on the form. I always inform claimants that this is the most important thing to do. You can imagine how alarmed I was to see that The Poverty Agenda Group Oldham And Tameside are in communication with the DWP. They are supposed to be helping people out of poverty rather than dragging them into even more poverty. You also might be interested to learn that Universal Credit has lead to an increase in domestic violence incidences. The lack of money, and one person controlling the household income has had a detrimental effect. People are suffering, that I and others have no doubt and the suffering will indeed continue. Universal Credit was created to cause suffering I’m sure of that. Update: I have been contacted by a member of Greater Manchester Poverty Action. This has absolutley nothing to do with their group. The group involved is The Poverty Agenda Group Oldham And Tameside. An email had been sent to Greater Manchester Poverty Action and the sender from the Poverty Agenda Group had included them without their knowledge. I have therefore amended my blog but I will not change my opinion that the original sender The Poverty Agenda Group Oldham And Tameside really need to think about their actions. Associating with the DWP is in my eyes morally wrong. 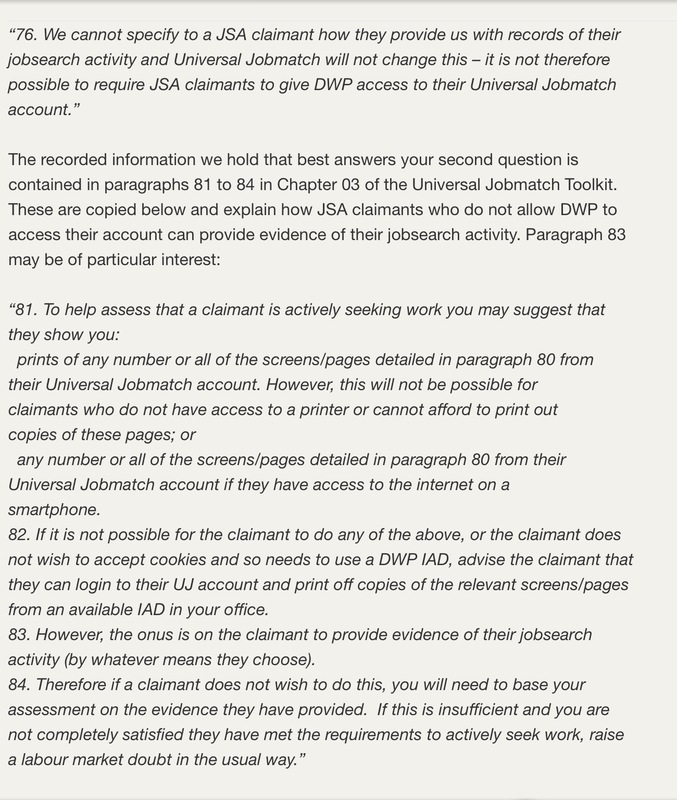 I find it very disturbing that they are in communication with the DWP. Very true. Universal Credit is not about people being ‘better off’, rather its about control and surveillance of the unemployed. Legitimising workfare as ‘work preparation’, and forcing the unemployed to take any job, whatever the low-pay or conditions. Duncan-Smith saw UC as an end to the culture of ‘just’ making a few job applications each week, and then getting JSA. Now in this new workhouse world, claimants are really going to have to suffer for their claim.